A blanket I knitted using mitered squares. The blanket is for my uncle’s greyhound Duke. Hi guys, I've just finished my second pair of socks from this designer, and I'm so inspired! I've been an avid sock knitter for a few years now, and I'm creating a bundle on Ravelry titled "I loved knitting these socks". These are obviously part of that bundle. I am in no way affiliated with this designer and I happily paid the few euro these patterns costs. Both of these sock patterns have brought me so much joy. They are addictive to knit, because you really want to get to the next part and see what happens. The other sock I just cast off yesterday. This pattern is called "Dotje...Sok" and it's a wonderful mix of some Fair Isle, mock cables and a German Short-row heel that is great for people with a high instep. I hope singing my praises is allowed, I really loved these two patterns and I just wanted to share. 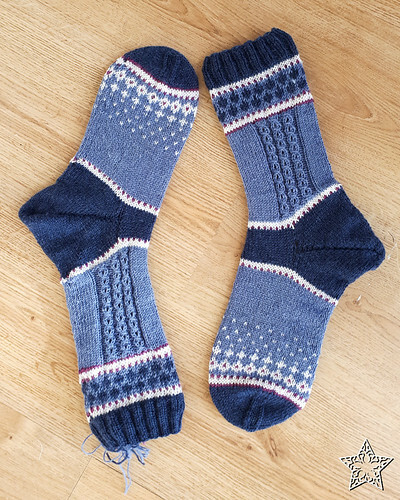 Heleen is wonderful, she designed both of these patterns for the Dutch Sock-knitters group, but the patterns are also available in English. Beautiful scarf...what size needles are used? Scarf and pattern I made on my journal. I was contemplating my next project, and I thought, "I know. What was that cute cardigan that spawned several hundred knit alongs a while back?" And then I fruitlessly wracked my brain. I remembered that some of those knit alongs were here, and there in the tags under sweaters, was someone asking for help on their Central Park Hoodie . 2007 was the year when everyone had to have one. Eh, what's a decade between knitters? I've just discovered the world of podcasts about knitting and other crafts on youtube. Right now I'm watching Arne and Carlos as well as The Grocery Girls. Have you watched any podcasts or even made some yourself? What are your favorites? I made a few different batches of leftover handspun yarns into a hat for a colleague at work. Another pair of gloves (probably a bit gloved-out now so working on a hat and some socks next). This yarn was dyed by my partner to make a scarf but there was loads left over - so has become gloves for a work colleague. I am knitting my first sweater - Mountain High. Its a top down raglan. I am just about at the point where I split off for the sleeves. The pattern has markers in and I'm supposed to knit to the first sleeve marker, then it says "Backward loop CO 15 stitches, place sleeve on to waste yarn." Also, I'm a bit worried the sleeve size for the size I'm doing is going to be too tight/small. Can I instead CO the # of stitches for the next size up (21) and just follow the sleeve directions for that size from there on out? This was a KAL from our Dutch Sock knitters group. The pattern was released especially for the month of December, and per the rules of the group you have to cast on in December and finish before the end of the next month (January in this case). 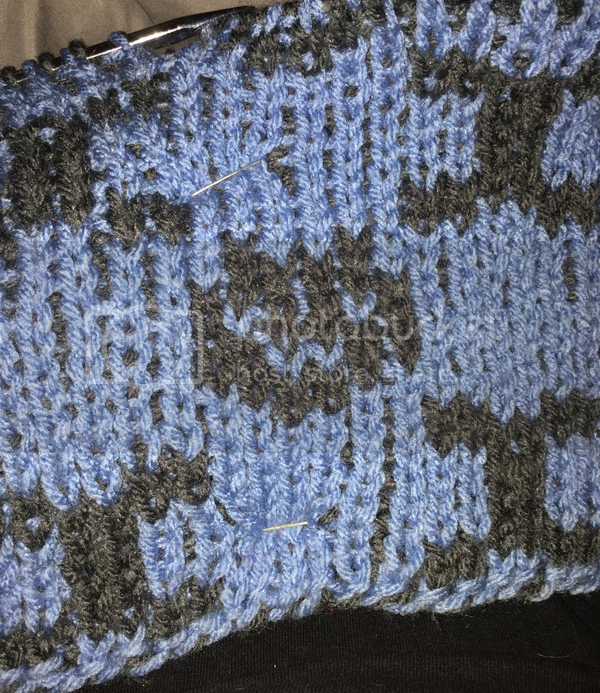 I cast on December 24th, and wove in the last bits of yarn on Janury 12th. It's a smaller size than I usually knit because they are going to a friend who didn't have such a great 2016. I hope these happy socks can cheer her up! And because knitting two socks that are exactly the same, I added a bit of cheeky detail. Let's fill this community with lovely knitting projects! I have a question about a Loops & Threads brand yarn called Woolike. This is the first time I am using this yarn and after knitting half a sock, I am finding the yarn to be creating a fuzzy halo-like finish which I think is being caused solely by handling the yarn. This makes me wonder if this yarn is going to pill quickly and make me cry because the pattern is cabled like mad so we're talking a lot of time and effort because of the fiddly nature of massive cabling. Anyway, my question is if anyone here has used this yarn and if so, what is your honest review and/or opinion about how well the finished socks will stand up over time, will they pill after one wear, or is this halo-like fuzzy finish the full extent of the 'wear'? I actually like this fuzzy halo effect, so that is not an issue for me. If nobody has used this yarn, where can I find written reviews, not a simple star rating? Also, what is up with the recent posting of video clips that aren't related to knitting? Dear people posting video clips: please stop. One row is dog bones and the other is cat faces. Several years ago I noticed a member of my knitting group was creating an infinity scarf which started in the centre and knitted round a moebius loop so that a 'row' was actually knitting on both top and bottom of the cast-on, and the scarf/cowl grew outwards from the middle. I'd love to try this, but I'm no longer in touch with the person who made it, and I really have no idea how to search for the recipe on Ravelry. Can anybody direct me to a pattern which works like this? It just sounds like such a fun way of knitting a figure-8 scarf. I can't be the only knitter finishing off my WIPs in preparation for the new knitting year to come. How are you guys progressing? My most recent finished project is this pair of Helix Socks in Onion Nettle Sock yarn. In stead of polyamide it uses nettle fibers for durability. It was my first try at some Onion yarn, and I like it! My partner is getting a rather complicated pair of socks for Christmas! what to do with this yarn?